How to Screen for Great Dividend Companies, Build your Dividend Portfolio and Unleash Your Dividend Income Stream! Dividends are responsible for more than 40% of the S&P 500's returns over the past eighty years. Yet dividend investing is the most overlooked strategy relative to value and growth investing. This is GOOD news, as there are many excellent opportunities today, especially for investors looking to improve their dividend yields in a low-yield world. To equip you with knowledge and the ability to build and manage your dividend portfolio, so that in the future, that portfolio will grow and replace your monthly salary, giving you the time and financial independence you deserve. The course will explain how to interpret and calibrate key financial ratios and gain the confidence to make sophisticated dividend-stock-picking decisions. Using the course’s proprietary 11 Dividend Growth (DG) mandates and 13 Dividend Sustainability (DS) mandates (checklists), you will begin to rely on a system, not emotions, to drive important investment decisions. This course will help you engage new software programs to screen for great dividend companies effectively, as well as track and monitor your returns efficiently. The curriculum will also touch on the technical aspects of portfolio re-balancing (using a customised Excel model). ✪ Please watch the free previews to gain further insights into this course. ✪ This course will not focus on REITs investment. For the latter please head to our REITs MasterClass in another listing. Why should I engage in dividend investing? The average historical performance of over fifty dividend-centric funds shows that dividend investing is a proven approach which can produce better and more consistent returns than the overall market. The research performed by Ned Davis shows that dividend investing is a good way to grow your passive income and wealth. In addition, this style of investing helps investors to focus on yield sustainability instead of share price movement, making them more business-centric and fundamentally disciplined. After attending your course, will I be able to find a list of top-paying dividend stocks? Yes, the course will teach you how to screen and filter for dividend-paying stocks*. There will be a list of dividend stocks provided as well as other investment tips*, but we encourage you to apply what you learn and create your own list instead. *Please read disclaimer in the course regarding stock picks and tips. Will my portfolio’s dividend yield increase after attending your course? Although this course focuses on teaching you how to find great dividend companies and helping you optimize your portfolio yields, there is no guarantee that your portfolio’s overall yield will increase. This is because great dividend companies may choose to repurchase their shares, pay down debts, or simply reinvest their extra cash in the business. Although your dividends might not increase, at minimum you will be rewarded with companies that have stronger balance sheets. Is dividend investing risky? Will I lose my capital? Most investment strategies carry some degree of risk—be it value, growth, or dividend investing—which can cause you to lose capital if market conditions sour. Whichever investment strategy you pick, if you do not understand what you’re doing or apply the wrong knowledge, you’ll expose your capital to unnecessary risks. That is why this course exists: to teach you, not only how to identify good dividend stocks, but how to avoid certain others. I’ve attended many investment courses, and many of them over-promise and over-inflate returns. Does your course fall prey to such misrepresentations? We will try our best not to state any unnecessary claims regarding an investment’s return. This is because, as experienced investors ourselves, we know that past returns do not guarantee future performance. Any returns stated in this course are backed up by academic studies or historic back-testing. We will not exaggerate them. Can you make me rich by taking your course? In addition, is your course easy to understand? Unfortunately, no. This is not a “get rich quick” kind of course. We do not promise mind-blowing returns, nor do we claim that this course is “easy” to understand per se. Think about this: If the methodologies taught in this course could be so easily implemented, then how would that add value to you? Your dividend portfolio’s net return would likely be the same as or lower than the general market. The difficult part of the course will be understanding why certain financial ratios are calibrated in particular ways and how the DG/DS mandates are formed and applied to your dividend portfolio. Having said that, we have done our best to summarise key points, made certain processes easy to apply, and provided the instructor’s personal email for consultation. How can I succeed in implementing dividend investing? If you want to succeed in dividend investing, you must first pick the right companies, align your dividend portfolio to your risk appetite, track and manage it, then diligently reinvest any dividends received. Which is why this course is not meant for everyone*. 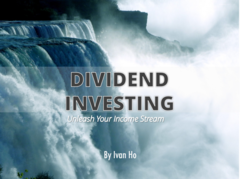 So do you have what it takes to complete this dividend investment program? If so, I’ll see you on the other side. Start investing properly today. Enroll Now! Ivan, graduated from one of Asia’s top business schools and trained as an lead trainer in various industries. Ivan is an avid value investor since 2007, and is considered by many as an up and coming leading authority on Dividend Yielding Investments. With his second published book: Winning with REITs, Ivan looks to help everyday, average investors significantly improve their investment returns and manage their portfolio risks properly. Once you are ready. Go ahead and SMASH that green "Add to Cart"button to Buy Now, and let's start your journey towards Financial Freedom today! *Note: this course is presented entirely by Rex Campbell's voice over.